Sega Saturn disc drives are beginning to die off. Until now, it meant your machine might be useless. Thanks to engineer James Laird-Wah, Sega’s 32-bit hardware has been cracked, allowing games to be loaded via USB. Laird-Wah is known online as Dr Abrasive, and is responsible for a USB-powered ROM-reading cartridge for the Game Boy called the Drag ‘n Derp. The news was revealed on the YouTube channel debuglive, which features an exhaustive interview with Laird-Wah, showcasing his multi-year process. Laird-Wah started poking around the Saturn in 2013, attracted to the machine’s notoriously ambitious multi-channel sound chip. “Gee, it’d be nice to have one of those around,” he said. To take advantage of that chip, he wanted to write software for the Saturn. 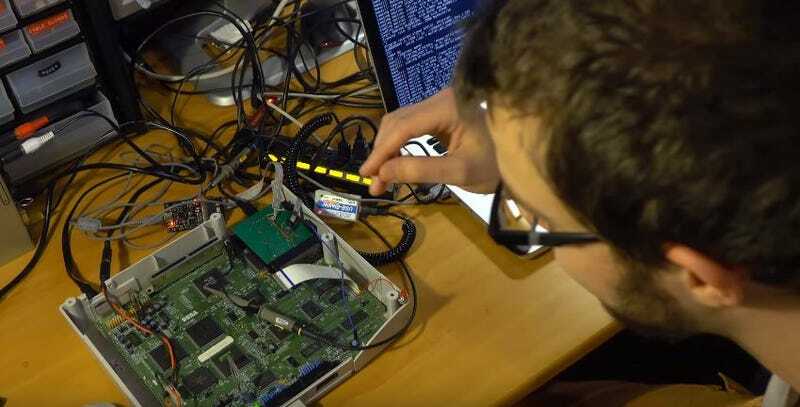 What he found was that Saturn homebrew required a mod chip—which largely aren’t produced anymore—and burning CDs for the Saturn to read. “We can probably do better,” he said. Thus, he went down a rabbit hole requiring years of reverse engineering. The reason it’s so notoriously hard to crack the Saturn is because of its hardware-based DRM, which required discs to have a physical mark—called a wobble—that was etched into the CD. Laird-Wah had to figure out a way for the Saturn to tell him out the disc drive worked, then come up with software that would allow him to emulate the disc drive over USB. This isn’t something you can buy yet; Laird-Wah is working out the kinks. Still, it’s a promising move towards revitalizing the Saturn community and ensuring the native hardware can be used to play games for years to come.